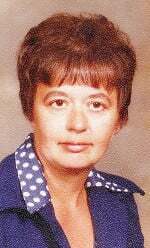 Janesville, WI -- Karen E. Hamlett, age 77, of Janesville, passed away peacefully at home on Saturday, April 13, 2019. She was born in Long Point, Illinois on August 19, 1941. The daughter of Wayne and Agetha (Merters) LeVelle. Karen married her loving and devoted husband, Richard Hamlett at First Presbyterian Church in Janesville on December 15, 1962. Karen was employed by Parker Pen for many years, and also for Central Police Equipment, retiring in 1985. Karen was a loving Mother and Grandmother, and enjoyed tending to her home garden and spending time outdoors. She is survived by her husband, Richard Hamlett; daughters, Kim (Mark) Sommerfeldt; and Kelly (Brett) Lipetri; grandchildren: Jessica (Dan) Brown, Josh (Liz) Lipetri, Storm Sommerfeldt and Travis Sommerfeldt; nieces and nephew: Steve (Connie) Tatge, Dawn (Dr. William) West, Bethany Mutter, and Michelle LeVelle; sister in-law, Karen (Thomas) Kleinhenz. Karen is predeceased by her parents and brother, Ellsworth W. "Sonny" LaVelle.